In which I look at rebranding, revitalizing, and renewal. Perhaps a fitting post for the day after Easter? I promised that you’d be seeing changes in me. Well. they are arriving. First, my website is being overhauled. Right now (today) if you visit my website, this, as in this blog, is what you will find. More is coming, but we’re not there yet. 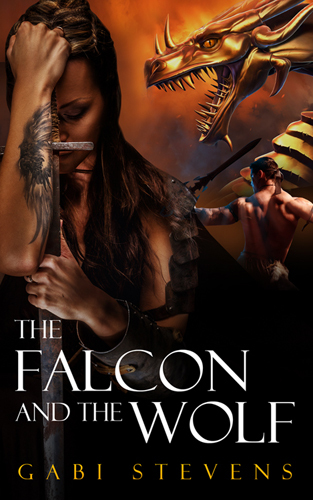 …(Third) a reboot of THE FALCON AND THE WOLF. I had released it under Gabi Anderson, but it didn’t fit with the non-magical historicals I’d written under that name. It is now available from Amazon and –this is the biggie–CreateSpace. That’s right! You can order it as a print book. Here is the link (I always find it wierd to create a link with the declaration of a link–it’s so meta.). A bit more expensive than the ebook, but what can you do? The link to the ebook is the caption. And I’m giving you a heads up–the listing hasn’t quite caught up with the changes yet; while, the author is now Gabi Stevens, it still is linked to Gabi Anderson, but you can find it on the Gabi Stevens author page, not the Gabi Anderson author page, but if you look up Gabi Anderson, it will still list it there too (Lots of buts). I figure it will take a little while to catch up. Maybe a few more emails. And there’s a new cover. Looks much more fantasy, huh? So keep watching. There will be another Gabi Stevens book before the end of April. Brand new, never seen before. I’m excited about this one.